Like Marty McFly being called “chicken” in Back to the Future, I also have a temper-tantrum point and it’s called ageism. Specifically when I’m treated like a kid or called “sport” or “tiger” or I am told “you will make a great pastor someday” and other comments that reflect on my youth (I’m under 35 years old). So I get feisty and do surveys about young clergy and write articles about young adults involvement in broad UMC stuff and “Hostile dragons for young clergy” and other things to channel that temper into something productive. But the thing is…ageism is also about the other end of the age spectrum. And I’m shocked at an Annual Conference (a governing body) of the United Methodist Church that has outright said that older people shouldn’t be considered for ordained ministry. 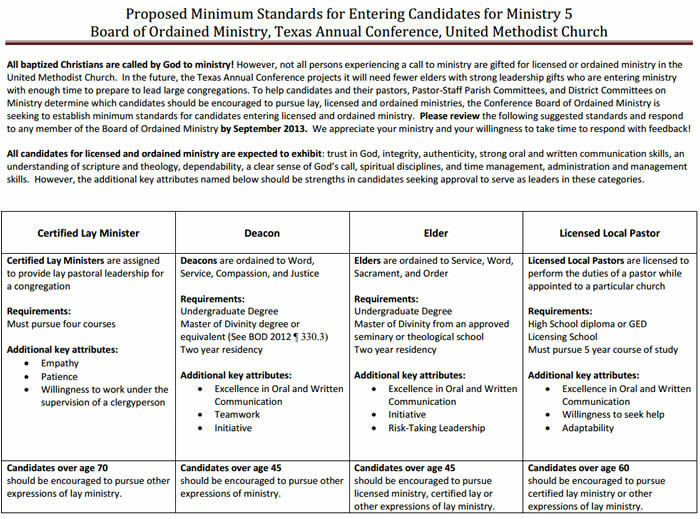 The Texas Annual Conference of the United Methodist Church has released a proposed “minimum standards for entering candidates for ministry” which outlines what are the bare minimum requirements for people to be considered for clergy work. Here’s the PDF and the scanned image is below (click to make it readable). Notice anything peculiar? The bottom chart has comments about candidates over a certain age. If they are over age 60-70, they should consider less rigorous forms of ministry (ie. less education and less opportunity for advancement, serving at the pleasure of the Bishop). Serve at the pleasure of the Bishop who can dismiss you when you reach 55 or so for whatever reason. I don’t know how you can frame this other than outright ageism. Sure, older candidates tend to have higher health insurance costs and ultimately may cost the system more. But to say they are less valuable for a particular position that doesn’t have health requirements other than across-the-board ones is just…bad. Is this really about senior adults? No. Let’s be clear: this isn’t even an attack on just senior adults but middle-age adults as well. 45? By the time I’m 45, my daughter will be 13. A pastor with a teenage daughter? That’s not relevant? Given that people wait to have their children until their early/mid thirties now, they are parents older and older. Why would we not consider them for ministry? And singles who are second-career or parents whose children have left home…they are perfectly capable of being Elders and Deacons. This is really personal to me. My senior pastor who helped me in my call to ministry and walked me through the process was commissioned at 41, barely within this rubric above. Without her, I would likely not be in ministry. There are tons of other second-career clergy out there who have received their calls to ministry later in life and are asking the church to approve them living them out. I’ve served now under two Senior Pastors who have been significantly older than I, to my betterment. I ran the numbers on 10 of my clergy friends in Oklahoma who I know were second career. Of the 10, six of them were Commissioned at age 45 or higher. Two of them are DSes, and four of them are/have been on the Board of Ordained Ministry. To lose the perspective of new middle aged and senior clergy in an Annual Conference, especially those that bring interdisciplinary expertise from their first careers, would be tragic indeed. I can name quite a few effective clergy leading vital congregations that were commissioned after age 45. I bet you can name several as well. If this policy had been in place at the beginning of their candidacy process we’d have far fewer ordained clergy clearly called by God and equipped with the gifts and graces for ministry. Our senior adult clergy are not only important they are integral to the life of the church. To exclude them from ministry because of their age and not their ability violates all kind of Social Principles and affirmations by the General Board of Global Ministries. And a church unbalanced to value youth over aged in both appointments and in ordination standards is not a healthy conference in the long run. This begs the question: what if every clergy person over 50 years of age was suddenly absent from our churches? How would that impact your conference? What message are we sending? What example are we setting? So, Texas Annual Conference. What do you have to say for yourself? Why don’t you want senior adults to enter ministry? 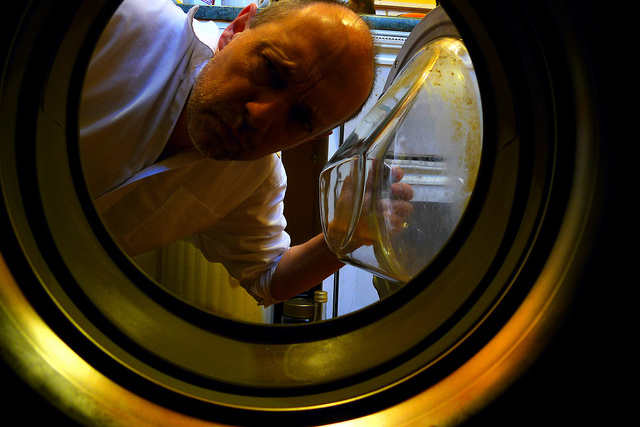 Why do you let a ticking clock block God’s call on lives that you are evaluating? But maybe you are being honest, Texas. Maybe you are just putting into writing what other Conferences are already doing, which is sacrifice qualified candidates on the shallow altars of youth. To shuffle middle-aged and aged candidates into positions and roles where they serve at your pleasure instead of being your equal. Maybe other Conferences are already doing this, and you decided to be honest about it. But really…I really hope this is just you. MSW, while I wholly disagree with even walking down this road in conversation or otherwise the proponents of this policy defend it by saying “no” to your last question. They insist this is strictly a “guideline” and reference several strata of statistical concerns. And that it does not mean a person that is 45 or older wouldn’t be considered for ordination. Having sat on several DBOM’s and a CBOM I think they are naive to presume how such guidelines would be interpreted and exercised if they should become official guidelines. As I have followed conversations at General Conference as well as a few other AC this is not the last time we are going to see these kind of conversations happening in our connection, especially as long as the current leadership at Episcopal and General church levels is in play and if they can successfully groom younger leadership and place them in position when they retire. Keep living and you’ll all be old one day. Since under 45’s are the best at leading the church I’d like to see a month of Sundays when the old people stayed home, closed their pocketbooks and sent their tithes and offerings to tv evangelists. It’s funny how God works. I have been praying about whether or not to stay with the UMC and pursue what I felt to be a calling with them. However, the more I learn about the UMC — especially after having read this post (and the comments) — the more I am saddened and disheartened. I think I need to find a denomination that is pro-life, pro-Christ, pro-Bible, pro-marriage, pro-servant at any age or weight… PRO GOD. I will just say, this is the exact opposite experience of the UMC than my own. It must be where you live because the churches and people I know in my area are exactly what you say you want to find. I don’t equate all of those positions as being Pro-God, but that’s a different topic. I just retired from 20 years in the military, and I would of liked to start working on a Master’s degree to become a pastor…unfortunately, I retired to Texas (thanks to my lovely wife), and will be over 45 once my degree work would have been done. By the Texas UMC’s own standards, John Wesley and other great ministers who had their BEST years of preaching in their old age, would have been forced-out early in their careers. God’s call to individuals trumps the church’s desire to save $$$ on the yearly budget; and these same people wonder why membership is declining? Jesus would be disgusted with the modern-day Pharisees at the Texas UMC! While I would want to affirm the call of God on anybody’s life, there can be an issue with someone starting the ordination process late, getting ordained and then retiring almost immediately because of their age. Or someone with health issues getting ordained and then almost immediately going into disability leave. I’m not saying that there should be limits on age or health, but if I was nearing retirement age I would wonder if pursuing ordination is the right thing to do if I was just going to turn around and retire. Also, while being ordained as a Deacon or Elder is a great thing in the UMC, the other forms of ministry are often neglected almost as if being a local pastor or certified lay minister is not a calling. They are a calling, and far more attention should be given to these forms of ministry. So, I want to affirm Gods calling of people of all ages. But I add that there can be valid questions about some people pursuing ordination as it currently works in the UMC. I don’t know the answer, but it’s an important discussion to have. God Incorporated. If UMC Inc. does not want senior citizens serving their members, then I expect that they will continue to bleed membership. It’s just strange that any church would have such onerous expectations on those wishing to serve. Our current United Methodist pastor was taken out of retirement to serve, we like him a lot; but then, I am among the youngest members of the church at age 57. Ageism is wrong; to expect God to honor this time table sounds like the Pharisees in the Gospel. There are other ways to serve; they don’t include retirement, nationalized health insurance, or any American standard benefits, likely not even a salary. The greatest benefit is having one Boss. Excellent post. ӏ սsed too be checking continuously tһis blog and I аm inspired! 🙂 ӏ takе care ⲟf ѕuch infoгmation mսch. time. Thank yoս and gοod luck. I am now more than four dacades old and about twenty three years baptised in the UMC. I think we are called at different times. Some are called young some older and that blends well. God’s time is the best. I have seen many youthful pastors who are found wanting later. Quick entry producing quick exits.